There is an unpopular truth the U.S. mine warfare community likes to point out; that of the 19 Navy ships sunk or seriously damaged in combat situations since the end of World War II, all but four were the victims of naval mines. Being statistically by far the likeliest threat that Navy surface ships face, it would be fair to assume mine countermeasures (MCM) command a correspondingly large chunk of the Navy’s best minds and resources. But such is not the case. Other, sexier threats – naval gunfire, attacks from sea-skimming, anti-ship missiles, enemy aircraft or submarines – are all preferred over that posed by grubby bombs floating in the water or patiently waiting on the seafloor. Naval mines have played a significant role in nearly every war in U.S. history, yet, ever since the Civil War, the Navy’s mine warfare branch has been stuck within a vicious cycle that has kept it surface warfare’s perpetual red-haired stepchild. The circle seems to work like this: A war starts and U.S. ships find themselves on the wrong end of enemy mines. Ships get sunk and sailors die, but even more importantly, the Navy loses control of the sea. The reason is that during peacetime, the Navy’s mine countermeasures force was allowed to deteriorate. Quickly, the Navy builds up a mine countermeasures force that is second to none and it performs brilliantly. But once the war ends, the minemen who don’t become civilians seek more career-enhancing billets elsewhere in the service. Within a few years, all but a few of the minesweepers have been scrapped or sold and the hard-earned institutional knowledge forgotten. But then another war starts, and the Navy again lacks a viable mine countermeasures capability and the cycle starts all over again. In October 1950, an American-led, 250-ship United Nations task force tried to send an invasion force ashore at Wonsan. But then they discovered there were more than 3,000 mines floating between them and the beach. Minesweepers were sent in but they proved unequal to the task. After three minesweepers were sunk and more than a hundred lives lost, the invasion was called off. On Feb. 18, 1991, during Operation Desert Storm, the amphibious assault ship USS Tripoli struck a floating mine, which tore a large hole in its hull. 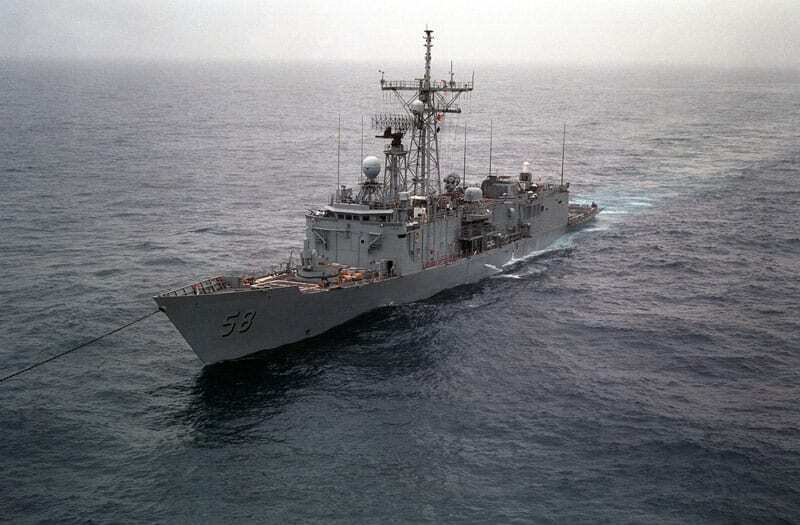 A couple of hours later the guided missile cruiser USS Princeton was severely damaged by a bottom mine. 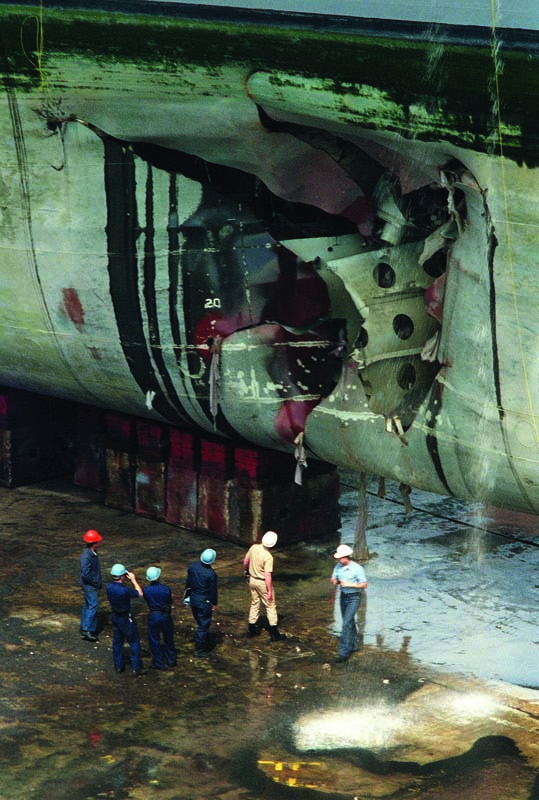 Though no one on either ship suffered more than minor injuries, the task force’s inability to deal with the Iraqi-laid mines was obvious and the option of an amphibious invasion of Kuwait was taken off the table. After losing three minesweepers and more than a hundred lives at Wonsan, the task force commander, Rear Adm. Allen E. Smith, famously lamented: “We have lost control of the seas to a nation without a navy, using pre-World War I weapons, laid by vessels that were utilized at the time of the birth of Christ.” Perhaps even more biting was the fact that it had happened only five years after the end of World War II, and in that short span, the Navy’s mine countermeasures force had deteriorated to the point that they were forced to turn to minesweeping units of the former Imperial Japanese Navy for help. Nothing exemplifies the sheer hideous elegance of asymmetric warfare as perfectly as the naval mine. They are cheap, ranging from about $25,000 for the most sophisticated, programmable “influence” mines, to only about $1,500 for ancient-but-still-effective contact mines. Either way, naval mines are well within the pocketbook of even the most cash-strapped Third World despot. This is why naval mines are sometimes called “the Poor Man’s Navy,” because a couple of well-placed, thousand-dollar mines can halt an entire naval task force in its tracks, giving its user a brief but critical moment providing parity with the most powerful navy in the world. Finding and destroying enemy mines once they’ve been laid is neither easy nor inexpensive, however. 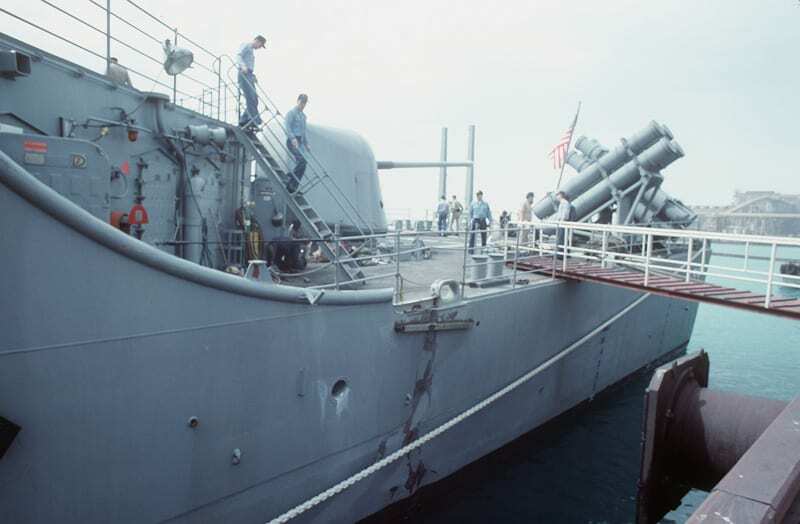 Minesweepers and hunters, or mine countermeasures vessels (MCMVs) as they are now called, are specially built, minimally armed warships with either wood, glass-reinforced plastic, or non-ferrous metal hulls and quieted engines to minimize their acoustic and magnetic signatures and keep the mines around them from detonating. MCM ships aren’t designed to move anything but slowly and very deliberately. The equipment used for MCMs is also highly specialized. At the time of the Wonsan debacle, most naval mines were relatively simple devices. They were floating, magnetic metal globes studded with numerous chemical-electric horns that would crush on contact with a ship’s iron hull, which would cause an electrical reaction and detonate the explosive charge inside the globe. Some of the pre-World War I mines behind Smith’s lament were M-08s, designed for the Imperial Russian Navy in 1908. (The Wonsan minefields also included advanced Russian mines.) Though they have been superseded by much more sophisticated, programmable, influence mines, they’re still just as deadly. Of the two Iraqi mines that damaged U.S. ships off Kuwait, one was a Manta, an Italian-made influence mine. The other was an Iraqi LUGM contact mine.